A self-proclaimed transformer, Hashimoto expresses the influence the image has on human beings in his own way. 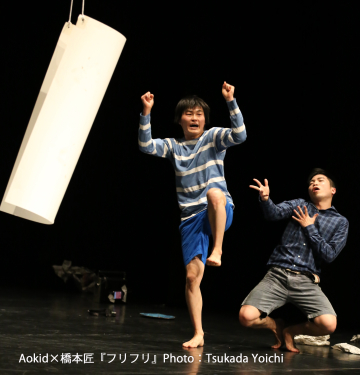 In the process, he has built his own improvisation methodology, “Transfoomeisou.” Recent performances have focused on the art scene and include the Nishi-Ogikubo Film Festival, the KAC Trial Program (Kyoto Art Center), and blanClass Live Art. He has also been developing activities as an actor that cross-cut fields. He has appeared from the early phase in Kishii Daisuke’s theater project Shimatsu wo Kaku and in a work by Wan Chon at the Asian Performing Arts Forum. Head of the performance unit Sanzan, he also undertakes planning and implementation at Yoshiwara Art Service.